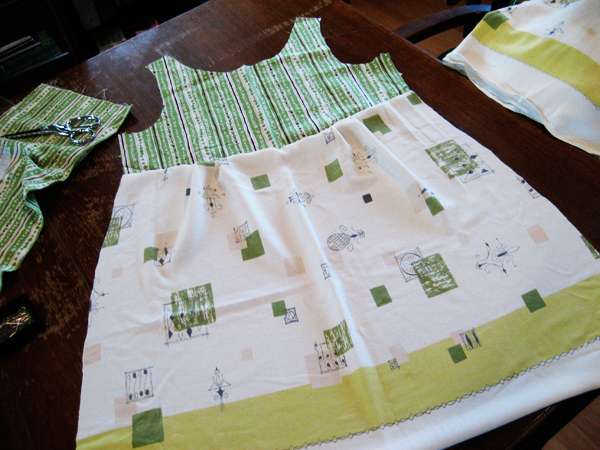 A few weeks ago I posted about a terrific pattern I’d discovered; a dress called the Piece of Cake (by Jody Pearl of Sew Outside the Lines). Pictured above is my dress in progress! The hardest part of this (I think) is the slight altering to the pattern that I worked through this week. I went between sizes for the top, and opened the front neck and arm holes a little. Super easy, really. 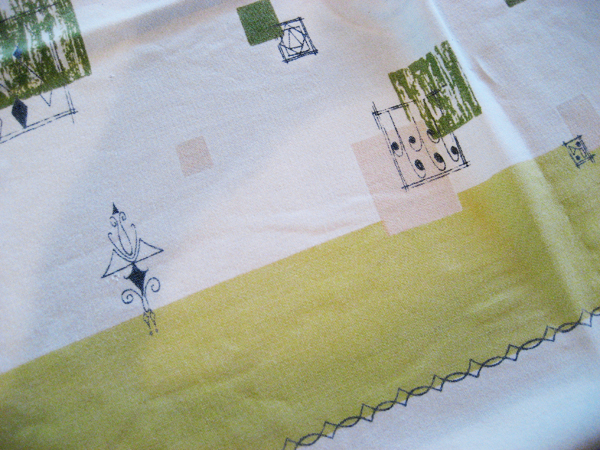 You may remember my excitement over Japanese fabrics I’d located on etsy, and yes, I did end up ordering some. However, for this first dress, I don’t want to start cutting into $18 per yard (GASP) linen, hence the above pictured mid-century table cloth I dug out of my dining room sideboard. It’s really lovely! And I was able to avoid the holes! The top fabric looks mid-century, but I’m not sure; it may be reproduction. It was a pair of pajama bottoms — already cut up a bit — scored at a yard sale. This is truly just so exciting and fun. I am enjoying it immensely and finding that I mostly do have the patience to do things slowly and with care. Sewing commences this weekend… wish me luck! Looking good – love the green! Congratz on the award, you totally deserve it! And thanks so much for nominating me and for your kinds words! Those are just about the best comptimenls my blog has gotten I’m so pleased that you like my photos, I’m super excited now hahahakeep it up! Stacey! Welcome and thanks so much for your reply. I don’t know why I didn’t get an email that you’d visited… so I apologize for the delay. I want to see your Pieces of Cake… are they on flickr somewhere? Share, share!!! PS: seriously, if I can manage the danged binding tape, you can too. It is tricky. But one of my “secrets” is to sew on the slowest speed possible on my machine. Which I do… all the time! Sometimes I think… if I sewed faster, it might be straighter, but every time I make a move to increase speed I feel like my machine is a runaway train, and everything just goes to hell in a handcart!!! Hi Jodi, found you through Jody Pearl’s blog. so loving your tunic, the colour will really make it i think. it’s a great little pattern isn’t it? Oh, I can’t wait to see what you make! Please post the photos when you’re finished. 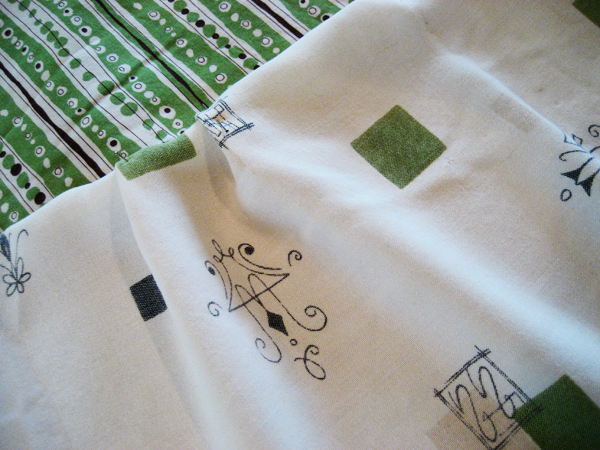 I have had a long love affair with vintage linens, especially the table cloths. They are no longer in thriftstores here these days, but I see them online and they are still less expensive than fabric yardage in many cases. I love how they have borders too… very fun! Thanks for stopping by! !